Flash Point: Fire Rescue, designed by Kevin Lanzing and published by Indie Boards & Cards in 2011, is a board game for 2 to 6 players, advertised as suitable for ages 10 and older (which I agree is the appropriate minimum age). It’s a family game of low complexity which is usually playable within 45 minutes. Many games claim to be “family” games while really only appealing to a certain age range/gender/mindset. But Flash Point: Fire Rescue truly is a family game. My first game involved four players ranging in age from 16 to 79, with both genders represented. Doesn’t get any more family than that! There are two versions of the game: the Family version and the Experienced version. Both versions are relatively simple to play (relative to the kind of games I normally play, that is), but the Experienced version has more options and “chrome” that will appeal to older children and even experienced gamers. The Experienced game adds additional help for the firefighters in the form of Vehicles (Ambulance and Fire Truck) and special abilities for the players (ex: Paramedic, Rescue Specialist, etc.). But it also adds more dangers like hazardous materials (HazMat) and Hot Spots, which make the fire more volatile and uncontrollable. In keeping with the “family game” theme, Flash Point: Fire Rescue Basic game can be set up and ready to go within minutes. The map board shows a bird’s eye view of a house, as if you’re looking down from above with the roof removed. It is a two-sided map, with one side designed to be more challenging as it has fewer entrances to the house (only 2 external doors vs. 4 on the other map). A clever “grid” system is used to uniquely identify any square on the map. The rows of the grid all have a red 6-sided die identifier (i.e. 1 through 6) and each column of the grid has a black 8-sided die identifier (1 through 8). When a random space needs to be selected, a player rolls a red 6-sided die and a black 8-sided die and looks at both numbers, tracing along the row (red die) and column (black die) to arrive at the space that meets at the intersection. To make things even easier, each space contains the red/black die number combination that uniquely identifies that space. Initially there are “Threat” markers placed in set locations within the house. One side of the Threat marker displays “Smoke” and the other side shows “Fire”. The initial 10 Threat markers are placed with the “Fire” side face up, to indicate a fire already raging within the house. Next, three potential “victims” are placed in different locations in the house. These markers are call “Point of Interest (POI)” markers and are placed face down so no one knows if it’s a real “victim” (person or animal) or a decoy. These victims are the key to victory in Flash Point: Fire Rescue. 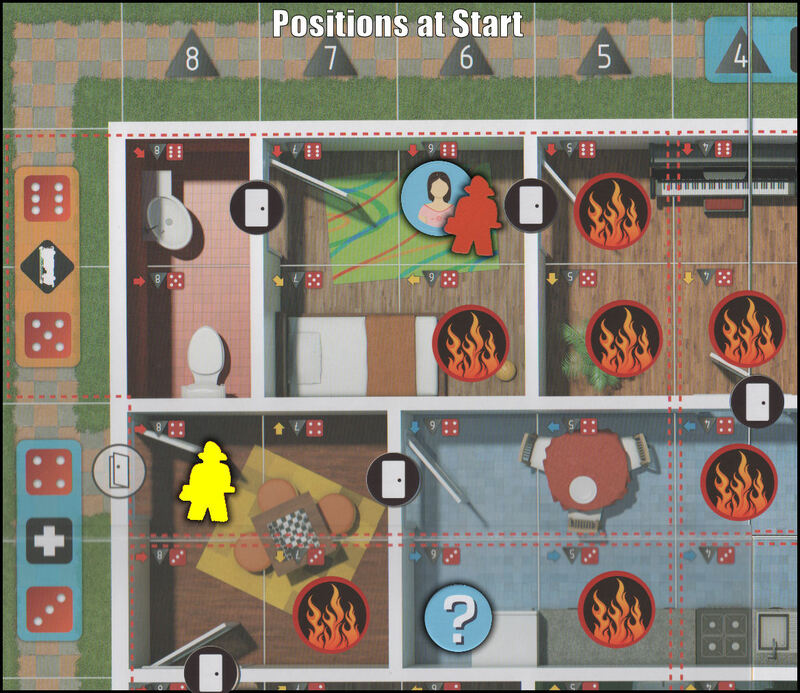 If 4 or more victims are lost to the fire, your cooperative team will lose the game instantly. Door markers are placed next, “Closed” side showing, on each of the 8 interior “doorways” in the house. Doors offer limited protection again spreading fire and explosions so it’s best to keep them in the “Closed” position as much as possible. An “Open” door is the same as “no door at all” when it comes to containing the inferno. Finally, each player assumes the role of a firefighter, takes one of the colored pieces and sets up in the street outside the building. There was a sales promotion in effect when I bought my copy of this game. They were offering free“Meeples” with purchase. For those, like me, who do not know a Meeple from a steeple, “Meeple” is a generic term for little wooden figures used in board gaming. So instead of colored bowling-pin-shaped units, I get to play with colored firefighter-shaped units. I wouldn’t go out of my way to buy Meeples, but I’m glad I have them as it adds another touch of flavor to the game. And the kids like them. Feel free to chat, coordinate your starting locations, and plan strategies. It’s a “cooperative” game, remember? So you all either sink or swim together. That’s it! You’re ready to play. Take Action – Spend Action Points, moving, putting out fires, chopping down walls and door when necessary and, of course, rescuing victims. What else would a firefighter be doing? Advance Fire – Roll dice to see if the fire spreads. Results can range anywhere from a new “Smoke” marker appearing, to a dangerous explosion and possibly a “ShockWave” and “Flashover”. Trying to keep control of the blaze is how the firefighters earn their pay. Replenish POI Markers – There must be at least 3 POI markers on the board at the beginning of each player’s turn. So, as victims are rescued, identified as decoys, or (gulp) killed, new markers must take their place. Dice are rolled to select random placement spaces for new POI markers. Each player, in turn, will continue to perform these three steps indefinitely, until the game is either won or lost. Prevent the fire from raging out of control. Prevent the collapse of the building. The victory conditions state that the players must successfully rescue 7 victims to score a win. If more than 3 victims are lost to the fire, they lose. If the building collapses, they lose. Success or failure rides on the shoulders of the firefighters and their ability to work as a team, and react to rapdily changing environments. In this brief Basic Version example, we have two firefighters (Yellow and Red) at work in the building. 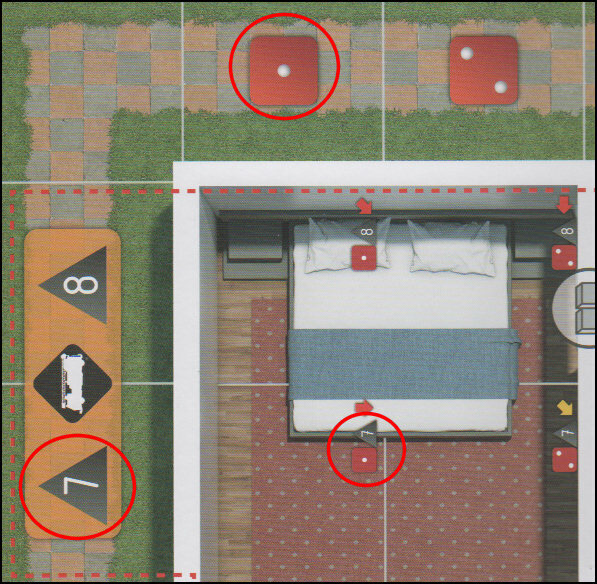 Initially firefighter Yellow is located in space Red:4/Black:8, located in the game room. 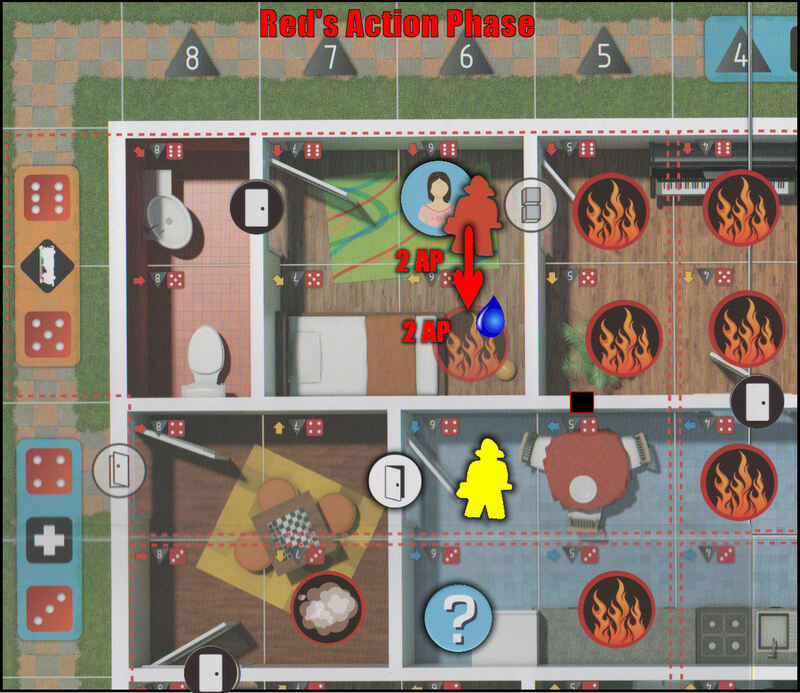 Firefighter Red appears to be trapped in a bedroom with a victim in space Red:6/Black:6. Firefighter Yellow is planning to reach the potential victim in the kitchen, while firefighter Red has already secured a victim and is hoping to carry her back through the family room (with the piano) and outside to safety. The problem for Red is that, after he entered the bedroom to find the victim and closed the door behind him, a nasty fire broke out in the family room! Because a victim can never enter a hex containing a Fire marker, Red will have to battle his way out. 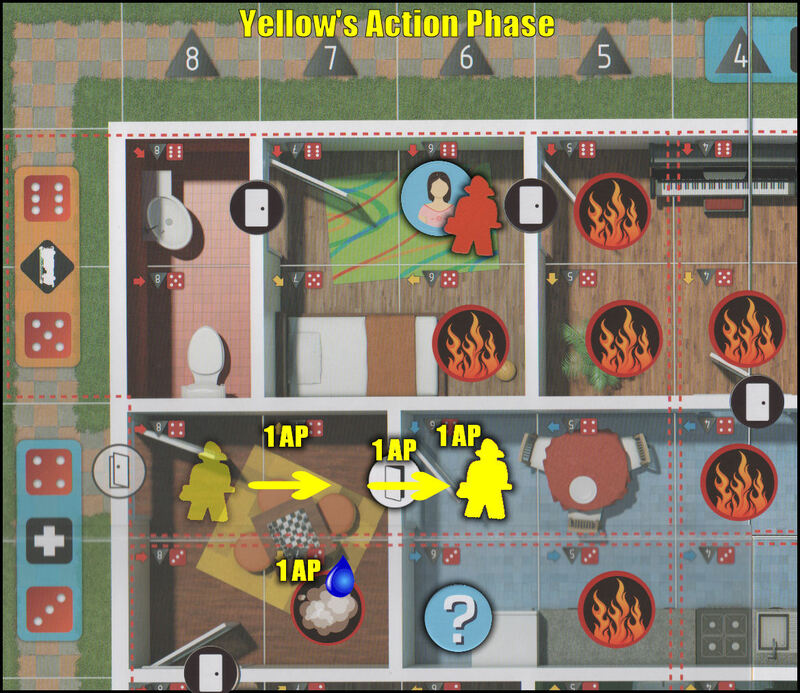 Yellow’s plan is to dash into the kitchen, rescue the victim there, then dash back out the same way she came in. The fire in the game room is diminished down to Smoke status, which lessens the danger of explosion a bit. It would have been better to extinguish the Fire entirely, but that would have taken an additional AP which she thought was better spent getting closer to the victim. The door to the kitchen remains open so she’ll be able to make a quick getaway after checking the POI marker (potential victim). Now that Yellow has spent all her APs, she will move on to the “Advance Fire” phase of her turn, which will be discussed below. After the player completes all desired actions, the next step is to see how the fire spreads. The black and red die are rolled to select a space on the board. A “Smoke” marker is placed on that space. If the space is empty and not adjacent to a Fire marker, nothing else happens. If that’s not the case then things could get ugly. For example, if the new Smoke marker is placed on top of an existing Fire marker an Explosion is triggered. Explosions spread fires very quickly and can destroy walls, doors and (gulp, again) victims. An explosion radiates out in all four directions and, if any adjacent space is already on fire, causes a Shockwave that sends fire tearing through the building (and any human beings in its path). Players must keep in mind that not only the victims, but the building itself is in danger. Small black wooden blocks are used to mark damage to the building’s walls. Most wall-damaging events, like Explosions and firefighters “Chop with Axe” action, cause 1 block to be placed on the wall. When 2 blocks are accumulated, the wall is considered “destroyed”. From that point on, it’s as if the wall is not there. However, there are only 24 blocks. When all 24 are placed on the board, the building is considered to have collapsed, killing everyone inside. Finally, when all the Explosions and Shockwaves are resolved, any Smoke marker that’s adjacent to a Fire marker is changed to a Fire marker. This operates with a “domino” effect; a string of adjacent Smoke markers will all burst into flames. Any victim marker that finds itself in a hex with a Fire marker (for any reason) is considered lost and counts against the players’ victory conditions. Firefighters are never killed, but they may be injured and sent back to the Ambulance, essentially putting them out of action until they can get back into the building. When the team is so dependent on every member to stay one step ahead of the blaze, such delays can cost them the game. We found it a challenge to get the fires under control while simultaneously trying to rescue the victims. But that’s the whole point of the game, isn’t it? Continuing with our example from above, it’s now time for Yellow to roll the dice and see how the Fire advances. Yellow rolls the red and black dice and the result is Red:6/Black:5, which places the target space just outside the bedroom door behind which Green is standing with victim slung over his shoulder! The rules indicate that if the target space already contains a Fire marker, that an Explosion has occurred and must be resolved. We have an Explosion! So the fire spreads east (from our perspective) into space Red:6/Black:4 where a Fire marker is placed, and stops there. It spreads south, where it encounters an existing Fire marker, thus causing a Shockwave. The Fire will continue through the existing Fire space and slams into the south wall, doing one point of damage. One black block is placed on the wall to signify the damage. If another such hit occurs on that same wall section, it will be considered destroyed. Most significantly for our example, the Explosion travels west where it runs into the bedroom door. When an Explosion (or resulting Shockwave) hits a closed door, the door is considered completely destroyed and the door marker is removed. However, if Red had not had the foresight to close the door upon entering the bedroom, the blast would have traveled right through the open door, knocking him down and killing the victim he’s carrying. This is a perfect example of how anticipating the worst case scenario can pay big dividends later on. There must be 3 POI markers on the game map at the start of any player’s turn. So, as the last step in the player turn sequence, if there are not 3 POI markers on the map, the active player must roll the red/black dice to select a space for placement of a new POI marker with “?” side facing up so that no one knows if it’s a real victim or a decoy. Sometimes you get lucky and the new POI will be placed in close proximity to one or more of the firefighters, but just as often you’ll find the new POI marker being placed far away from all firefighters. And, if the dice are against you (and they always are), the new POI may land in the midst of a block of Fire markers. We skipped Yellow’s “Replenish POI phase, as we’re just assuming that there are 3 POI markers currently on the board. We can move on to Red’s Action Phase. Head for the closest door, which is in the family room (just past the piano; not pictured), fighting fires every step of the way and hoping he does not have to face another explosion. Chop his way through the external wall. Head south, putting out the fire there and moving away from the open door. Chopping through the external wall to the north sounds like a really good option at first. Except that he’d have to use all 4 of his APs to chop through the wall, and would have to wait until next turn to actually move out of his current space. Considering what just happened during Yellow’s Advance Fire phase, I can’t imagine he’s want to stay put and take his chances with the fire raging to his east and south. So firefighter Red chooses the third option. He snuffs the fire to his south using 2 AP, and then carries the victim into that space with his remaining 2 AP. Now at least he is not directly adjacent to any Fire markers. And, more importantly, he’s now just on the other side of a wall from firefighter Yellow. Yellow can use her APs to chop down the wall, and Red can simply carry the victim through to safety on his turn. 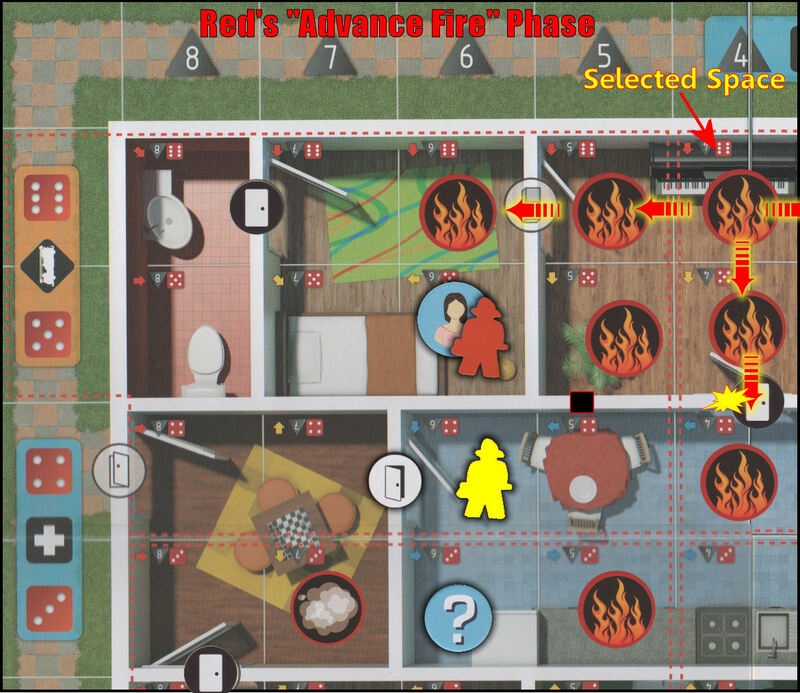 Wrapping up this example, on Red’s “Advance Fire” phase he rolls Red:6/Black:4 and attempts to place a Smoke marker there. But, lo and behold, there is already a Fire marker in that space, so another Explosion occurs! Amazingly, the selected space is right next to the space that Yellow rolled on her turn (although not too amazing since I’m the one creating the example and I’m trying to make a point). This time, when the Shockwave expands to the west, there is no bedroom door to hold it in check, so the flames leap right into the bedroom and into the space where firefighter Red and his victim would have been standing had he chosen to try to chop through the exterior wall. Another disaster averted due to Red’s good judgment! I hope this brief graphical example has given you an idea of how the game is played, as well as some sense of the decisions that you’ll be faced with when playing Flash Point: Fire Rescue. The Experienced Game takes just a bit longer to set up because there’s a lot more going on. It has three levels of play: Recruit, Veteran, and Heroic, with Recruit being similar in difficulty to the Family Game, and “Heroic” being (as you might imagine) very difficult. I played at the Veteran level just to get a good sense of how much more difficult the game becomes. Things become noticeably more difficult right from the setup. You have to randomly place, and then resolve, 3 Explosions. So, the center of my building was already an inferno, with three points of Wall Damage to boot! Add in the placement of 4 Hazardous Materials markers and 6 Hot Spots and you have all the ingredients for a bad day. With the introduction of HazMat and Hot Spot markers, the “Advance Fire” phase of each player turn now has the potential to create a genuine conflagration! Paramedic – Can resuscitate a victim. Fire Captain – Can “delegate” 2 AP each turn to another firefighter, essentially commanding that firefighter to move or Open/Close Doors during the Captain’s turn. Imaging Technician – Reveal a POI marker anywhere on the board (detects “dummy” counters). 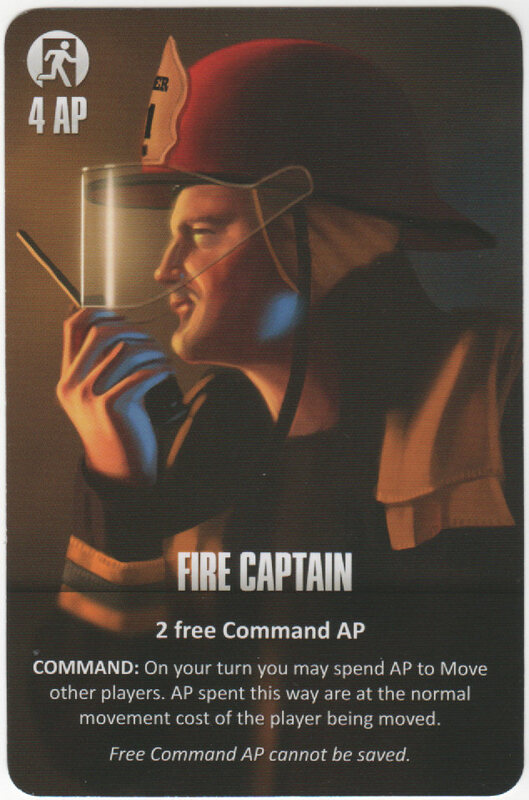 CAFS Firefighter – Gets 3 AP + 3 free Extinguish AP per turn. Generalist – No special abilities but has 5 AP per turn. Rescue Specialist – Get 4 AP + 3 free Movement AP per turn. Driver/Operator – Can drive the fire engine and fire the “Deck Gun” (i.e. water cannon). More than anything else, the introduction of special abilities puts additional burden on the players to cooperate and utilize their enhanced proficiencies to maximum advantage. The “system” grows exponentially more efficient in the Experienced Game. So too must the players if they hope to win. Having these advanced firefighting capabilities is great but only if used properly. I would definitely recommend the Experienced version for older kids (13+), adults, or experienced gamers. There’s a lot of random luck (both good and bad) in this game, but performing actions efficiently requires thought and care on the part of the players. Sometimes there’s just a right and a wrong way to do things, and you’ve got to be right more often than you’re wrong. Coordination with your fellow firefighters is critical to the success of the team. Do you focus initially on putting out the fires, letting the victims wait until the fire is more contained? Remember that after every player turn, the fire will spread by an unknown amount. It could be just another Smoke space, or it could be an inferno that kills one or more of your helpless victims. So you must strike a balance between containing the fire and getting victims moved to safety. Do you walk all the way from the game room, through the kitchen, dining room and play room to get to the victim in the small bathroom? Or do you just chop down the shared wall between the game room and the small bathroom? Every wall you chop and every wall that is damaged by the fire has a cumulative effect on the stability of the building. A building collapse is the worst way to lose because it’s usually the result of bad decisions made earlier in the game. With each game you play, proper techniques start becoming more apparent. For example, there’s definitely a right way to manage a large block of “Fire” spaces to minimize the repercussions of an Explosion/Shockwave. There are also times when it’s smarter to just move a victim to a safer location, put the victim down, and then return to fighting the fire, rather than charging into a perilous situation in a mad rush for the exit. But we’ll reserve those discussions for a future strategy article. Bottom Line: The game got mixed reviews from the participants. The younger ones felt that it could have been more exciting although it appeared to me that they were getting mini-adrenaline rushes here and there, while waiting to see if an Explosion was going to take them, and the hapless victim they carried, off to the afterlife. But I can understand that. Competing with the sensory stimulation of XBox, Playstation or mobile gaming devices is a tall order for a board game designer. The experienced gamers and adult players found the Family Game a bit too simplistic, but thought the Experienced game was more fun. Our 79 year old firefighter loved the game, but thought it went on too long (the Experienced game lasted just about 50 minutes). I think he would have considered a 30 minute session to be perfect. My own opinion is that any game I can share with everyone from my youngest son to my father-in-law deserves high praise indeed. It really grew on me. The very first (Family/Basic) game I played was a bit of a dud as everyone was learning the rules and just kind of sleepwalking through the motions. But, with each subsequent game, I enjoyed it more and more. The firefighters “cooperative” won about half the time, which puts game balance right in the sweet spot. Each game progresses differently. Sometimes, things go so smoothly you just can’t imagine how you could possibly lose. Other times you see just how horribly wrong things can go if the “Advance Fire” rolls go against you. So there’s a sense of urgency in every game that most of us found enjoyable. This was really my first experience with a “Euro” type game. I’m generally a hard-core hex map wargamer. But I have to say that I enjoyed Flash Point: Fire Rescue enough that I’ll probably try other Indie Boards & Cards games in the future. Congratulations to the designer and publisher on a job well done. Posted in Flash Point: Fire Rescue and tagged Board Game Review, Cooperative Games, Family Games, Indie Boards and Cards, Kevin Lanzing. Bookmark the permalink.